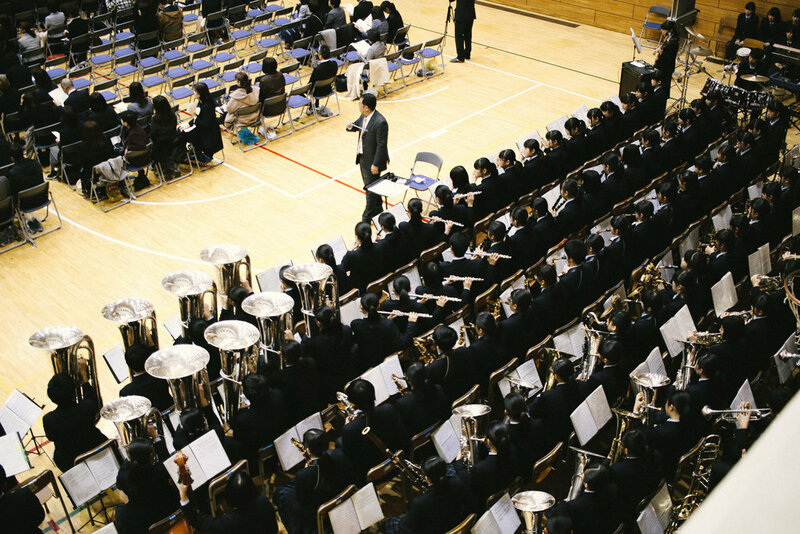 March 8th was my third and final graduation here at Kashiwa Municipal High School, and it was a day I will never forget. 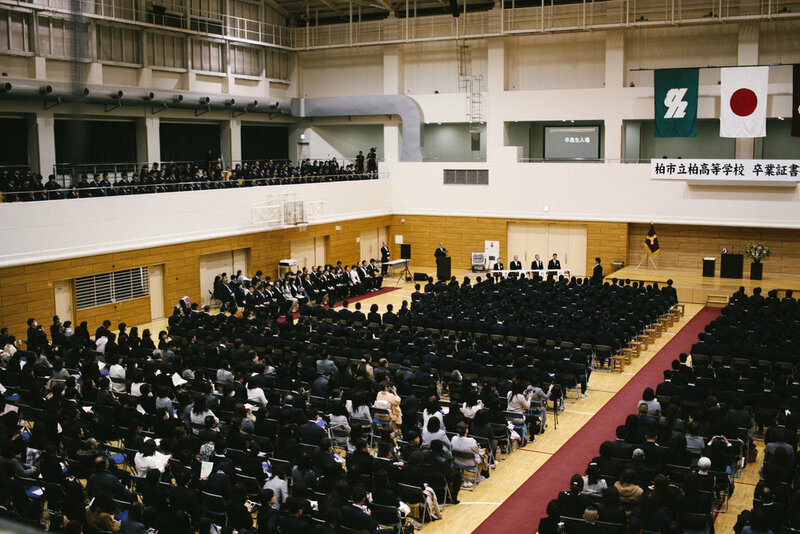 Graduation was held in the morning, in our school's huge sports arena. It happened to be very rainy and cold that day, but thankfully all the students and parents were able to arrive safely. 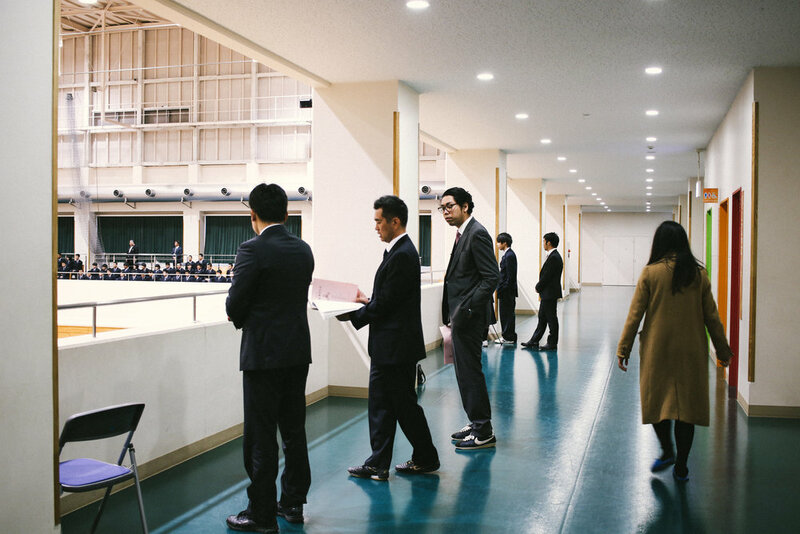 Everyone filed into the arena for the 10am ceremoy. Every year, all the teachers and students are gifted manju (bread with red sweet bean) and the best part is our school mascot that is printed on top! You can't really tell in this picture, but he is an Eagle with a hat on so people call him "eagle-cap" haha! Oh, and the manju are red and white which represents the Japanese national flag and cremonial colors. My duty was 受付 receptionist and I was in charge of checking in the parents of class 3-A.I have known the 3-A class my entire time here at Ichikashi and they hold a special place in my heart. I was so happy to finally see their parents! I could almost instantly tell who's parent it was based on their face alone, and I was so happy to tell them "おめでとう！“ congrats! All 314 graduating students waited in the hallways for their grand entrance! Katayama sensei is a 3rd year homeroom teacher so she came dressed in a beautiful kimono! I love this part of Japanese culture! A few moms came to the graduation in a kimono as well, and I thought it was such a beautiful sign of celebration and respect. I love the flower given to all the graduating students to wear! It is so simple and beautiful. The brass band did an incredible job, as usual. They perfomred the national anthem, a graduation song, as well as the school anthem. The 2 hour ceremony contained A LOT of bowing...and no clapping. You could hear a pin drop at any moment - scary! 4) they must bow for a 1...2...count and then rise on 3. After the ceremony, the audience is allowed one chance to clap for the graduates as they exit. The homeroom teachers gather at the back of the arena to cheer them out...it's the one moment of the whole day that feels like an American celebration! Myself, along with a few other teachers, watched the ceremony from above...a much more relaxing place! The 1st and 2nd students all sit up at the top of the arena and must watch the entire ceremony and participate in all the formal bowing as well. Many of them were nodding off the whole time (I don't blame them) but it is cute to see them support the seniors. In Japan, every school has mandatory "indoor shoes" that the students must wear ONLY inside...so after 3 years they are in decent condition and one of my coworkers likes to take advantage of this and collect shoes to send to countries in need. After the ceremony, the graduates have one last homeroom where they are given their yearbooks and hear one last speech from their homeroom teacher. Steph, my former coworker, came back to Japan last week just in time for graduation!! It was really fun having her back at school and all the students were stoked to see her. 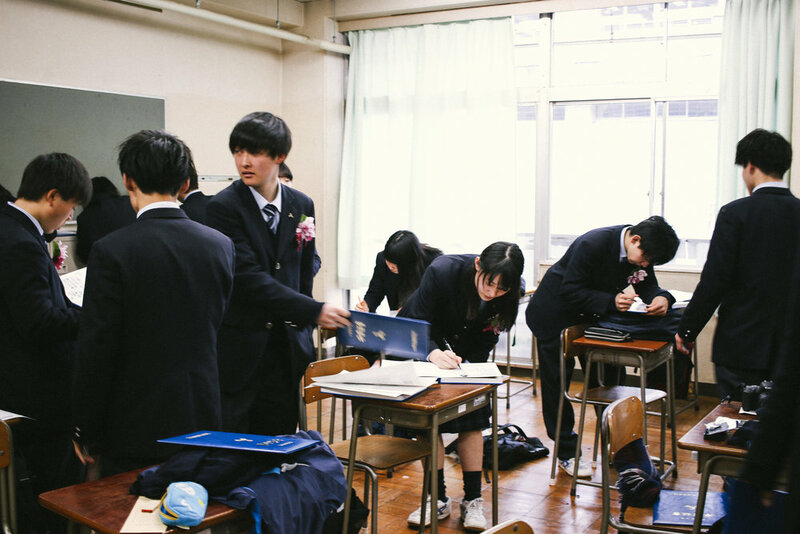 Similarly to the states, students sign their classmates yearbooks. NOT similar to the states, is the quality of the yearbooks!! They are SO fancy and nice. wow. Mashiko Sensei was the homeroom teacher of 3A...the class that is very near and dear to my heart. Mashiko is a true father figure to this class and he did an amazing job guiding them through all three years of high school. It was an emotional moment when he gave his final speech to them...and we were all crying!! The moms all came in to witness the last class for their kids..Mashiko thanked them all of their hard work raising their kids and for making their bento every day...touching moment. It was an extreme honor to teach these students for three years. This group of kids is very special to me and I will never forget them. Hideki, Kyousuke, Kodai, Daisuke, Ekai, Kurtian, Keita, Kodai, Ryo, Avhishek, Chris, Yukika, Yuka, Sayaka, Moe, Yuna, Minori, Mana, Miyu, Fumina, Moyu, Hikari, Hikari, Juna and Kana...CONGRATS!!! THE BEST IS YET TO COME!! !